Hip dysplasia affects many different dog breeds throughout the world - the German Shepherd included. 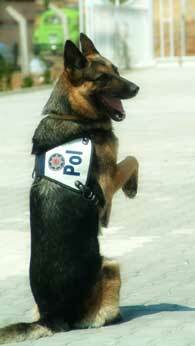 In fact, German Shepherds are among one of the many dog breeds at risk for hip dysplasia. It is important to note that around 15.5% of German Shepherds born between 2000 and 2002 were diagnosed as dysplastic, according to the Orthopedic Foundation for Animals. Additionally, 17% of GSD's born between 1990 and 1992 and 20.3% born before 1980 were dysplastic. This does show that the rate of dysplasia in GSD's is decreasing which is encouraging. It is also important to note that the rate of excellent hips has increased in the breed to 4.2% in GSD's born between 2000 and 2002, compared to 3.8% for dogs born between 1990 and 1992 and 2.6% for all GSD's born before 1980 so we are moving in the right direction. To better understand what dysplasia is in relationship to the hip joint, and how to treat it once the dog has it, we must have some understanding of the basics of this debilitating condition. This condition is considered to be the most common heritable orthopedic disease in large and giant dog breeds and that millions of dogs worldwide are affected by it. Currently, there is no genetic test for hip dysplasia due to its complex genetic nature and the fact that possibly two to four gene pairs and possibly more are involved. 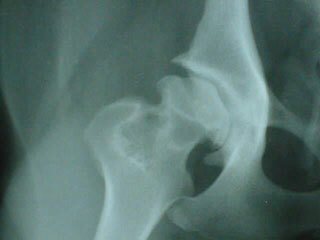 Best described, dysplasia is caused whenever a laxity (or looseness) occurs in the joint between the femur and pelvis. Over time this looseness causes damage to the femoral head(ball) and to the acetabulum (socket) so that they do not fit properly. Osteoarthritis, or degenerative joint disease (DJD), also commonly accompanies dysplasia, causing additional pain and disability. This damage then causes arthritic changes in the joint which often reduces the range of motion and causes pain and inflammation. This often causes the dog pain in the morning when trying to rise, causes difficulty in even small leaps and sometimes may even cause weight loss or decreased appetite. The inheritance of "good" or "bad" hips is dependent on many genes and is truly too complex an issue to be discussed in this short introductory article. In many cases, however, the origin of the problem is simply genetic and is passed on from one generation to the next generation. Further, to make the picture even more confusing, German Shepherds with almost identical genetic makeups may have a wide range of differences in what degree of hip dysplasia they may display as adults. This fact can be attributed to the differences of environmental influences on the development of the hip joint, and most especially the strong effect of diet on a young dog. Proper nutrition is essential for the development of a strong healthy dog. Keep in mind, however, poor or excessive nutrition can exacerbate genetic tendencies toward hip dysplasia. Dogs must be at least two years of age to be certified hip dysplasia free by the Orthopedic Foundation for Animals (OFA). Testing for hip dysplasia is very simple. X-rays are taken of the hips, mailed to the foundation (OFA), examined by radiologists and graded on the actual appearance of the hips. Dogs which show signs of hip dysplasia are not good candidates for breeding and do nothing to further the soundness of the breed. Changes in lifestyle, such as correct weight management and exercise, are really important. Controlled exercise can help relieve pain from arthritis. It's important to remember that the right amount of exercise helps maintain muscle tone and strength, while helping to stabilize the dysplastic joint, but too much exercise is bad all the way around. Swimming is a great non weight bearing exercise that can help maintain your dogs muscle tone and range of motion without adding additional stress on those painful joints. If a dog exhibits any signs of pain, stop the exercise and take care of your dog in pain asap. Currently there are several treatment options for dogs diagnosed with hip dysplasia, most involving surgery of some type. The most curative option is a “Total Hip”. 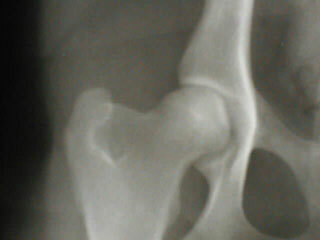 Basically, this involves replacing the head of the femur and the acetabulum of the pelvis with artificial components. Touted by veterinary surgeons as the most effective walking aid for dogs with hip dysplasia, arthritis, spinal trauma, and fatigue. Provides safe, secure, comfortable support for dog's rear end. Neoprene, with secure Velcro and buckle closures for easy on/off. Machine washable. Sizes: S, M, M/L, L, XL (please see size chart, above). Another option is a triple pelvic osteotomy, which entails repositioning the sides of the pelvis in relation to the femurs. A third surgical option is called a femoral head and neck excision. This basically eliminates bone to bone contact and forms a false-fibrous joint. This procedure is of limited use on larger dogs. A dysplastic dog who is not required to perform or physically work a great deal can often be managed with pain medications. Often, a mild pain reliever may be all that a dog needs to be comfortable enough to go about his daily routine. Alternative treatments are available as well. Glucosamine and Chondroitin have been used to treat osteoarthritis in Europe for over twenty years and is becoming quite popular in the US as well. Because of the huge number of humans and pets suffering from osteoarthritis and the tremendous success in the treatment of this disease when using Glucosamine and Chondroitin, many companies are now producing a product line and several broad research studies are underway. Osteoarthritis also affects small dogs and cats and Glucosamine and chondroitin have been used very effectively in relieving their symptoms as well. Glucosamine and chondroitin are normal substances found in the body of living animals. They are at their highest concentration in cartilage. In normal healthy animals the body is able to synthesize enough glucosamine to keep the existing cartilage healthy, but when the animal ages or there is damage to joint cartilage it cannot produce enough to keep up with the body's needs. This is where a supplemental form of glucosamine is needed.